All the heavy lifting of your garage door inevitably wears your springs to the points where they break. When this happens, the extreme pressure they’re under can send the spring flying at full force, damaging your property or injuring anyone who’s close. To avoid this kind of scenario, you need to look for signs that your garage door springs are getting worn and hire a professional right away to replace the old springs and prevent an emergency from occurring. To do so, you first need to identify what type of garage door springs your system has in place. Two main kinds, torsion springs and extension springs work in different ways and are in different places. The torsion springs are usually mounted above your garage door opening and are tightly wound to provide the necessary torque to lift and lower the door. 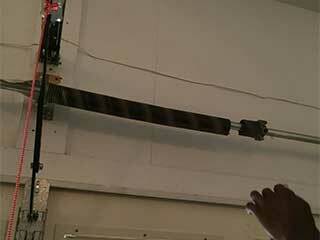 When your garage door is rising, you will notice the torsion springs by their turning motion. As a rule of thumb, the torsion springs are the less dangerous type and require less moving parts which make their servicing easier and increases their durability. On the other hand, the extension springs stretch and compress as your garage door opens and shuts. You will find them running along the ceiling on both sides of your door. Recognizing that your extension springs are wearing out is extremely important as they tend to behave quite violently when they snap. These types of springs are also fairly affordable which makes them the most popular choice among residential homeowners. Regardless of your garage door spring type, we can help. Our professionals at Garage Door Marietta, GA have over a decade of experience in all types of garage door repairs, including broken spring replacements, adjustments, and repairs. We strive to employ the best of the best in the industry, and our technicians undergo rigorous training procedures to always be able to come to a solution that will get your door back in action in no time.